The New York Times, the paper of record, engaged in a minor revolution of sorts Tuesday, publishing — and then deleting — a shruggie in a headline. “It’s Going to Snow Again. How Much? 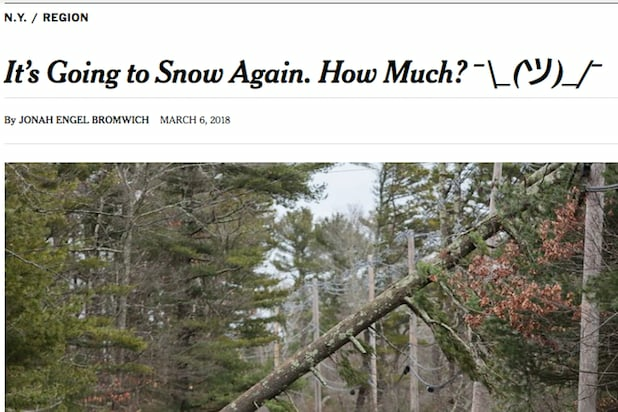 ¯\_(ツ)_/¯ ” wrote Jonah Engel Bromwich for the paper in anticipation of a nor’easter set to descend on the tri-state area Wednesday. “Here is the process,” Bromwich told Nieman Lab reporter Laura Owen, dropping a rare nugget of a Times Slack exchange that hasn’t been obtained by Ashley Feinberg. But as quickly as the paper made history, it moved to delete the shruggie. A look at the article on Wednesday morning revealed that the typographical icon had been removed among other updates to the post. An archived version of the original can be viewed here. Hey Jon! Our editors let it ride into the night, until around 11, when snowfall estimates began to sound more definitive. It had always been the plan to phase it out if/when that happened.